It may be a wonderful world, but as Dan Riskin (cohost of Discovery Canada’s Daily Planet) explains, it’s also a dangerous, disturbing, and disgusting one. At every turn, it seems, living things are trying to eat us, poison us, use our bodies as their homes, or have us spread their eggs. 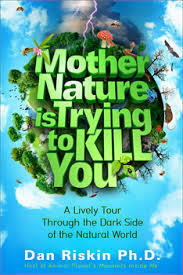 In Mother Nature Is Trying to Kill You, Riskin is our guide through the natural world at its most gloriously ruthless. Using the seven deadly sins as a road map, Riskin offers dozens of jaw-dropping examples that illuminate how brutal nature can truly be. In the spring of 2010, one lone Steppe Eagle was shot down on a firing range in Afghanistan. Fortunately, help was available from former Army Ranger Scott Hickman and his buddy, Navy SEAL Greg Wright, who took him in and gave him the healing he needed. They named him Mitch. Clare Balding is an award-winning BBC broadcaster and writer. At the London Olympics of 2012 she was proclaimed a “national treasure. '” She became the face of the BBC’s horse racing coverage in 1998, and now works across a wide range of sports. She will join us to tell tales from her new memoir, My Animals and Other Family. As a young woman, Jane Goodall was best known for her groundbreaking fieldwork with the chimpanzees of Gombe, Africa. Goodall's work has always been controversial, mostly because she broke the mold of research scientist by developing meaningful relationships with her "specimens" and honoring their lives as she would other humans. Today on Vox Pop, bird expert Rich Guthrie answering your avian inquiries. WAMC's Ray Graf hosts.